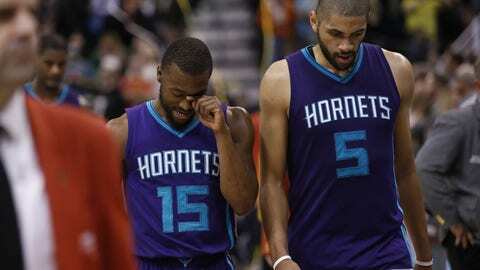 The Charlotte Hornets are in the midst of a terrible slide down the standings. What swingmen are available to give them the scoring punch they lack? The Charlotte Hornets are a pedestrian 14th in offensive rating, per NBA Stats, relying heavily on the playmaking abilities of Kemba Walker and Nicolas Batum. Walker especially doubles as the roster’s best one-on-one player, the place the team looks when they need a basket in crunch time and in late clock situations. Remaining so one-dimensional offensively will catch up to any team and it’s seemed to do so in Charlotte, with Walker’s field goal percentage returning to earth at about 44 percent the past two months after shooting a career-best 48 percent in November. Veteran forward Marvin Williams has returned to earth this season after shooting a career-best percentage from 3-point range last season and Michael Kidd-Gilchrist remains an absolute liability offensively without a semblance of a jumper. The Hornets attempt to alleviate some of the pressure offensively with Marco Belinelli and Frank Kaminsky playing 24 minutes a night, each with herky jerky moves that can con the defense into biting on their array of dips and stutters. 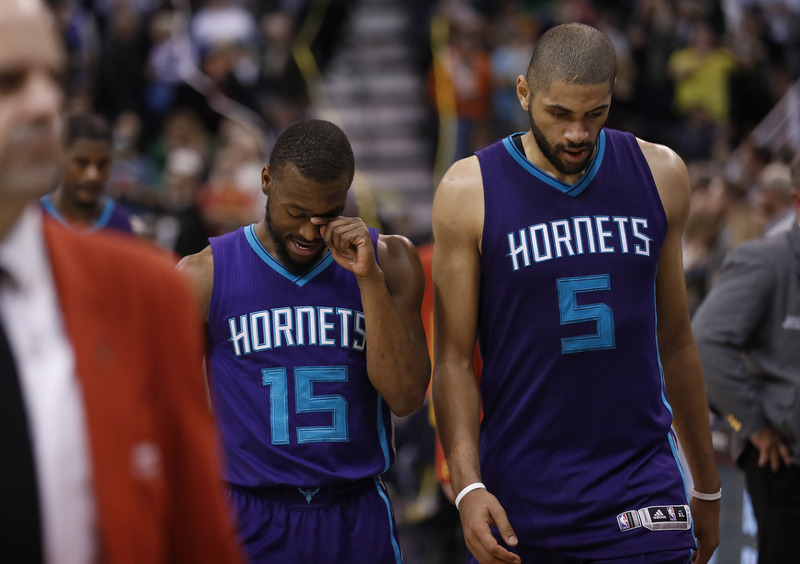 The Hornets’ playoff chances are officially in jeopardy after this most recent slide. They made a move for Miles Plumlee last week, possibly a sign of things to come. Who else could be on Charlotte’s radar to shore up their squad? 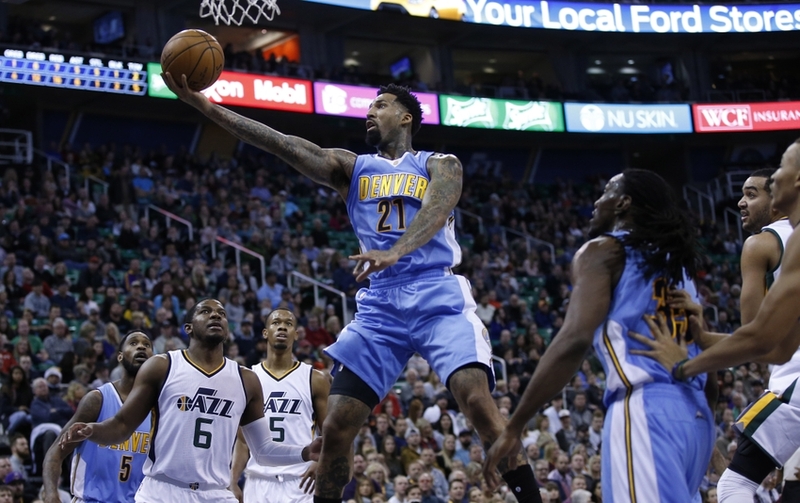 Swarm and Sting’s Jerry Stephens penned earlier this week the idea of swapping Wilson Chandler for Michael Kidd-Gilchrist, as Sam Amick of USA Today reported that Chandler is unhappy with his role on the Nuggets and wants out of Denver. The contracts match up, as both players are signed for multiple years at comparable prices, and in Kidd-Gilchrist Denver gets another young piece to grow with its youthful nucleus. In Chandler, Charlotte gets the scoring wing they so desperately crave. Despite his playmaking abilities, Batum is not a natural scorer, as his field goal percentage is down to 40 percent this season. Chandler is in the midst of arguably his best season, averaging 15.4 points, 6.7 rebounds and 2.1 assists on .449/.338/.742 shooting. He’s a slashing wing that thrives operating downhill and using his 6-foot-8, 225-pound frame to create space between he and the defender. He also shoots much better on 3-pointers considered “open”, shooting 37.4 percent from deep on those shots, per NBA Stats. Trading for Chandler would give the Hornets a lineup of Walker, Batum, Chandler, Williams and Kaminsky or Miles Plumlee until Cody Zeller‘s return. A lineup with good length at four positions and positional versatility with the ability to space the floor. Steve Clifford’s scheme calls for floor spacing and 3-point shooting at a prolific rate. Chandler helps reach that goal. 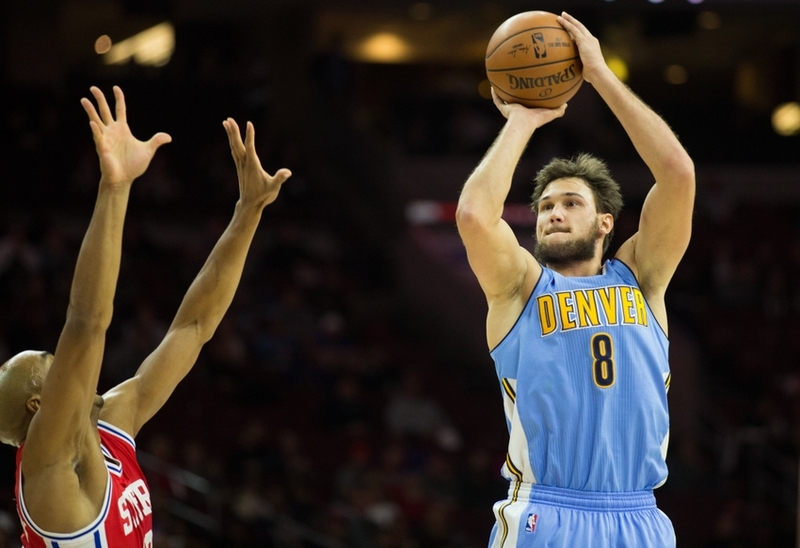 The Nuggets are ripe with trade assets and Danilo Gallinari is one of the most tantalizing. The 28-year-old forward is averaging 17.2 points, 4.9 rebounds and 2.2 assists per night on .432/.381/.887 shooting. Recently Gallinari has been out due to a left groin strain, but the injury doesn’t seem overly serious. His size at 6-foot-10, 225 pounds makes him another swingman with positional versatility to play the 4 spot down, and he can bang bodies with surprising success. However its Gallinari’s shooting stroke and shot creator abilities that remain the most alluring. A career 86 percent free throw shooter, Gallinari also has developed a tendency to get to the free-throw line, attempting six free throws per game this season. In 2015-16, Gallinari finished fourth in the association with 8.2 attempts from the line per contest. The deal would likely include Kidd-Gilchrist, with a second Hornet pitched in to sweeten the deal for the Nuggets giving up their primary scoring option currently. Jameer Nelson would give the Hornets a bonafide second unit point guard and they are in need of one with after Ramon Sessions‘ torn meniscus. Gallinari gives Charlotte the option of playing him at the 2, 3 and 4, as Batum is also a Swiss army knife of sorts, able to play several positions. Those two working together as long-limbed wings attacking and playing off of one another would be a deadly threat alongside Kemba’s All-Star ability. 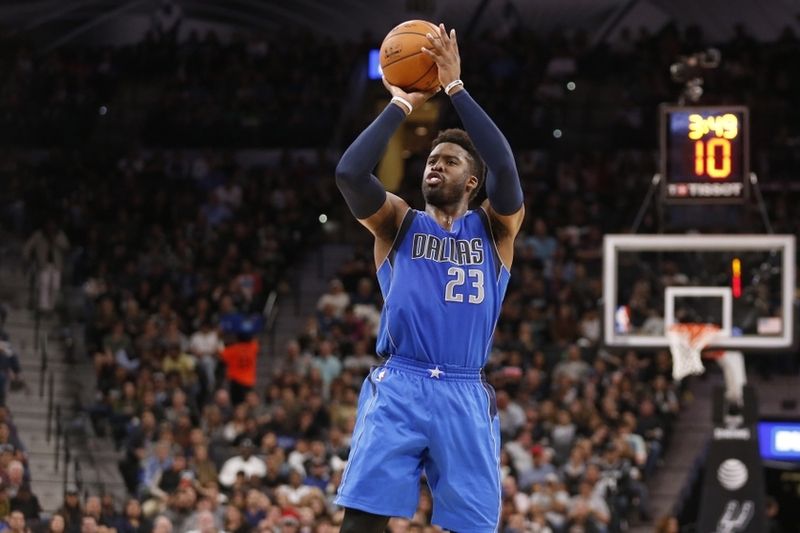 The 30-year-old is looking more and more like the Wesley Matthews of old, as evidence keeps piling up that recovery from a torn Achilles is a two-year process. Matthews’ numbers are comparable to his Portland Trail Blazers 2014-15 season that netted him a four-year, $70 million contract from the Dallas Mavericks, as he’s averaging 15.2 points, 3.6 rebounds and 2.3 assists per contest on .398/.382/.815 shooting. He’s been Dallas’ secondary scorer most nights behind Harrison Barnes and is shooting a nice percentage from behind the arc on 7.3 attempts per game. Most importantly, he seems to have most of his quickness and all of his confidence back from that terrible injury two seasons ago. Matthews used to be a lockdown defender in Portland and may have the ability to return to that form in a more defensively oriented team in Charlotte. His 6-foot-5, 220-pound frame would be a perfect fit between Walker and Batum at the 2 spot, hounding opposing shooting guards on a nightly basis. The Hornets would receive Matthews, a high-level starting shooting guard that has shown plenty of tread left on the tires, and a young wing in Justin Anderson to grow. The Mavericks would receive a defensive stopper in Kidd-Gilchrist that is still only 23 years old and Jeremy Lamb, a scoring guard who is also younger than 25 that can eat up plenty of minutes among the Mavericks’ young core. 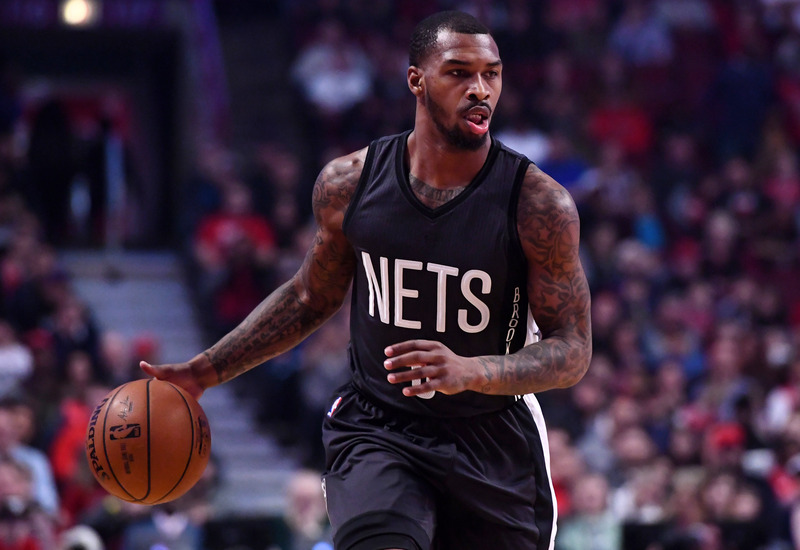 After floating between 10-day contracts in the NBA for two years, Sean Kilpatrick caught on with the Brooklyn Nets late last season, appearing in 23 games for the Nets and averaging 13.8 points per game in that stretch. Now, Kilpatrick is the team’s third-leading scorer on a two-year deal with the second year unguaranteed, though the Nets are sure to bring him back. Were the Hornets to acquire Kilpatrick, they would almost certainly shed some money towards the cap, as Kilpatrick’s deal is worth a little more than $2 million over the two seasons. He’s quietly become one of the league’s best contracts on the worst team. His line of 14 points, 4.1 rebounds and 2.4 assists per game on .421/.353/.844 shooting puts him on par with Oklahoma City Thunder guard Victor Oladipo, a much more heralded player. This trade would free up about $5 million in cap space for the Hornets and give the Nets some badly needed shooting. The Nets very may well want a pick, which may change the pieces of this trade a bit, as maybe Brian Roberts and a second-round pick would be more appropriate for Kilpatrick in that scenario. Kilpatrick showed his scoring potential earlier this season, as he rung up 38 points on the Los Angeles Clippers in November.